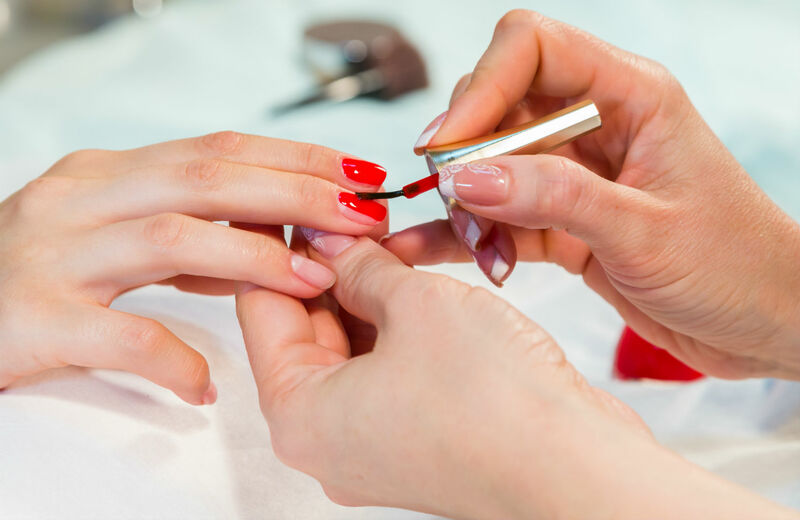 Could the chemicals in beauty products be causing long-term health problems for salon workers? Beauty can be painful: just ask anyone who’s ever sat in a salon getting their scalp seared with straightener or their fingers soaked in noxious chemicals. But the problems aren’t just skin deep; the glamor of the cosmetics industry hides many underlying health hazards. The materials used in salon treatments like perms and manicures are as dangerous as any industrial chemical. But unlike industrial workplaces where protective equipment is often the norm, at salons personal image and comfort are paramount. So regulation remains a gray area, consumers ignore those ugly fumes, and yet for workers who labor all day in these shops, practically every breath may carry toxic risks. Citing the unique risks faced by the many women workers of childbearing age, the report cites research showing that “[h]airdressers and cosmetologists may be more likely to give birth to low birth weight babies.” A study on New York cosmetologists found heightened risk of low birthweight and postpartum hemorrhage, measured against a comparison group of realtors, which was in turn linked to the frequency of administering perms and hair spraying. Often, the health risks faced by women workers are exacerbated by low incomes and limited access to health care. The research gaps and safety risks reflect deeper deficits in the public health system. The chief regulatory agency responsible for overseeing the industry, the Food and Drug Administration, is notoriously weak, underresourced and corporate-friendly. According to WVE, “The Food, Drug and Cosmetics act contains no provisions that require evidence of the safety of ingredients in cosmetics products prior to their marketing.” If something does go wrong, the agency generally must rely on “voluntary” recalls, in which corporations choose whether to comply with the government’s warnings about their consumers being slowly poisoned. But environmental standards don’t blend easily with retail operations more focused on pampering than regulating toxins. For workers, a major obstacle to improving environmental health is that the workplace dynamics are complicated by culture and language gaps, as many of the salons are staffed and run by Asian immigrants, and safety monitoring and enforcement tasks are left to the private sector. The WVE report notes that “health and safety rules and regulations in salons are often promulgated by the state cosmetology and barbering boards.” So while Vietnamese women workers are left struggling to breathe, their communities may be distanced from, or wary of, regulatory authorities and, in turn, alienated from crucial guidance and training on best practices (even simple things, like keeping shop windows open). Some of these manufacturing companies lie on their labels, like labeling everything “natural” when it really isn’t or hiding the truth about some of the ingredients used to make their products. Also, it’s truly harder to find healthier options when it comes to some products, so it’s hard to get around it.… The major challenge is compromising your health in order to do what you love and also to take care of your family. To alleviate the burden on workers, WVE recommends, in addition to tightening occupational safety standards, moving toward a proactive, precautionary approach to commercial toxins, focused on reducing risk through local “healthy salon” certification programs, and advocating for scientifically informed, safer product alternatives. That could start with a community-driven movement to demand greener beauty products. From Victorian Painted Ladies to Brazilian Blowout, the marketing blitz driving our beauty obsession has historically eclipsed the struggles of the women who make cosmetic fantasies come true. Today, their health concerns are no longer invisible, and it’s time to find a way to pursue beauty without masking harm below the surface.